Junior forward Grant Jozefek skates the puck through the neutral zone in NU's last game against BC at the Garden on Feb. 11. 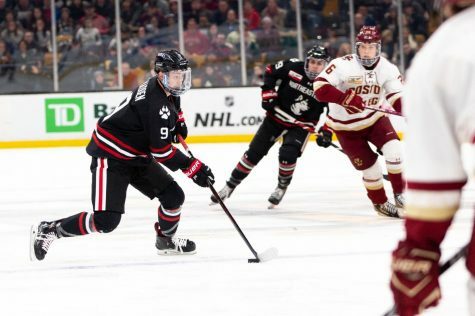 For the third time in the team’s history and the second time in four years, Northeastern won the Hockey East championship Saturday night at TD Garden with a 3-2 win over Boston College. Senior forward Brandon Hawkins scored two first-period goals and sophomore goalie Cayden Primeau held strong toward the end of the game. 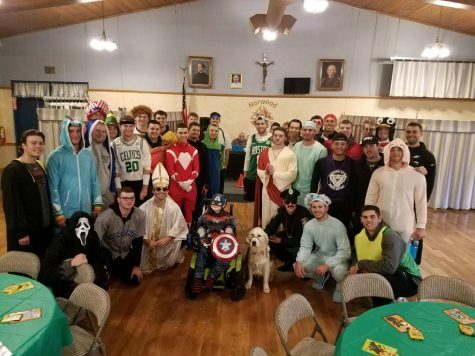 “There’s a confidence — a quiet confidence with the group, and they don’t really get rattled and they just go out and play and it doesn’t bother them,” head coach Jim Madigan said. “We have a resolve and resiliency. That’s the next stage to our evolution as a program. Nearly 30 seconds into the start of the game, the Huskies (27-10-1) had a big scare when a struggle for the puck ended in an apparent goal for the Eagles (14-22-3). It didn’t count, however, as it was illegally pushed into the goal with a player’s hand. 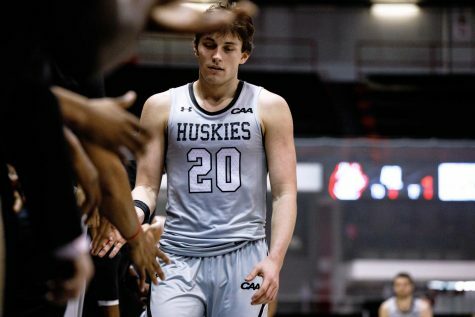 A mere two minutes later, NU junior forward Matt Filipe responded with legal score, giving an early 1-0 lead to the Huskies. 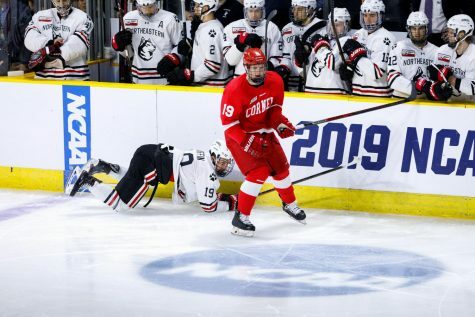 The Huskies were on a roll, as three minutes later senior forward Brandon Hawkins spun on a dime and wristed a shot past BC goalie Joseph Woll, giving the Huskies a 2-0 lead only five minutes into the game. 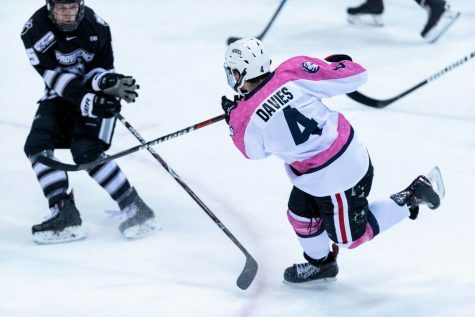 Six minutes later, with five seconds left on a power play, Hawkins struck again with a one-timer from the point that beat Woll to his glove side, making it 3-0 with eight minutes left in the first. BC couldn’t get anything going in the period as star NU goalie Primeau deflected shot after shot. BC eventually redeemed itself early into the second period with a goal from freshman forward Oliver Wahlstrom 18 seconds in and a goal two minutes later from junior forward David Cotton, making it 3-2 Huskies. The first goal was the fastest goal to be scored at the start of a period in a Hockey East championship game. BC pressed for the remainder of the game, but Primeau was equal to the task and finished with 29 saves. 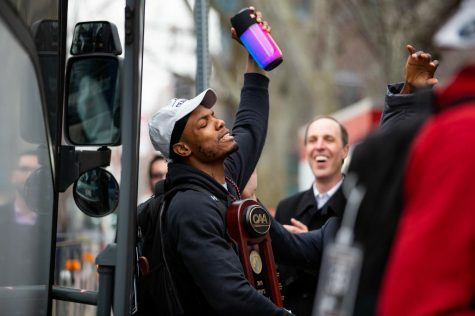 He was recognized as the conference tournament’s most valuable player after the game, less than two months after receiving the same honor at the Beanpot. “There were times this year where we didn’t score as many goals as we like but we’ve got a goalie who can keep us in the game and we’ve got five defensemen who know how to defend,” Madigan said. 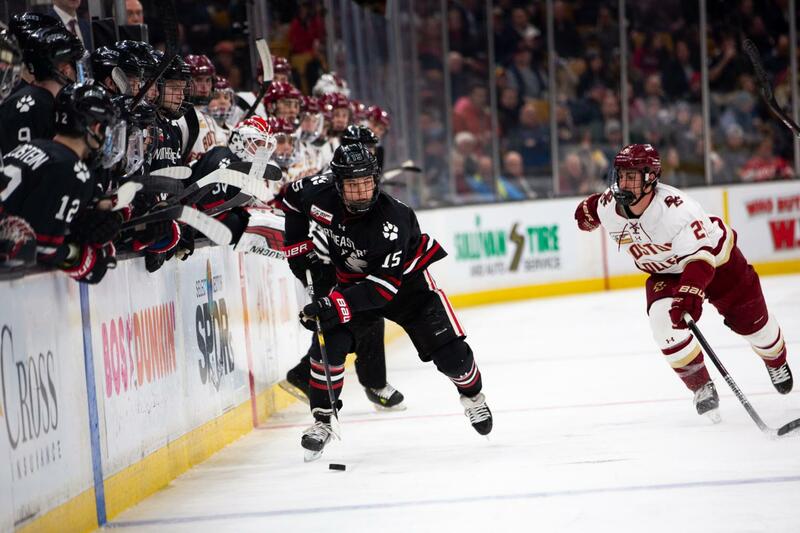 The Huskies won three of their four matchups against the Eagles this season, including their 4-2 win in the Beanpot final. Seconds into the third, BC sophomore forward Logan Hutsko slammed into the glass with another player, causing a scary injury. He was taken off the ice on a stretcher and taken to Mass General Hospital, where BC coach Jerry York said he was conscious and able to move fingers and toes. The Eagles couldn’t make a comeback after Hutsko’s exit despite piling on the pressure near the end, ending the night with a 3-2 Huskies win. The Huskies walk away as Hockey East champions and with five members of the all-tournament team (Hawkins, Zach Solow, Jeremy Davies, Ryan Shea and Primeau). Primeau was also named MVP of the tournament. They join UMass and Providence as the likely Hockey East representatives in the NCAA tournament. This is also the first year that the men’s and women’s Hockey East championship went to the same school. The Huskies will find out their location and opponent for an opening-round NCAA Tournament game tomorrow.